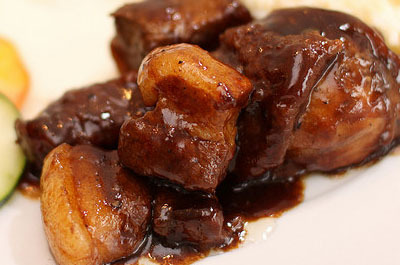 There are many versions of the ever-popular adobo; this one is from Joel Fabay at the Manila Hotel. It combines chicken and pork with vinegar and a hearty helping of garlic. 1 Prepare the Green Papaya Pickles. 2 Combine the pork, garlic, onion, soy sauce, vinegar, pepper, bay leaves and water in a pot and bring to a boil. Reduce the heat and simmer until the pork is partially cooked, about 10 minutes. 3 Add the chicken and simmer for another 20 minutes, until both the pork and chicken are cooked. Remove from the heat and serve on a large platter with a bowl of the pickles on the side.